India has around 40 to 80 mn people with some form of disability. Children with disabilities are 5 times more likely to be out of school than average. Disability is not limited to any age group, religion, gender and even social status. It can happen to anyone, anytime and at any place. The nos are only expected to grow given our poor education system, higher rates of accidents amongst others. Being handicapped is the biggest handicap especially in a country like India where the people with disabilities are treated with great ostracism; lower self esteem and poorer infrastructure and living conditions. Irrespective of the fact whether one is born with disability or suffered in due course of life, they are treated with utmost pity and pseudo sympathies. People’ whole persona is challenged and their identity is reduced to the disability they are cursed with. Stigma spreads fast like cancerous disease and sometime becomes impossible to cure. A lot of such people, kill themselves in fear of implacable atrocities, continued ostracism or live a life of extreme suppression under extreme conditions. Disability could be in any form, starting from locomotion or orthopedic to visual/hearing impaired and much more. It is very debilitating to a person’s body, mind and soul too (I cried when I heard stories of many poor, handicapped women at Orissa & WB, who were illegally confined in houses tied with a chain, subjected to cruel rapes by multiple people). The person is often seen as disgrace, a dirty patch to glamorous society and a burden to people around (God forbid, if you are women.). Families starts disassociating with them, or they become taboo in their social groups, siblings sometimes sneers at them, friends move away and employers shy away even if they write- we are equal opportunity providers in big bold letters in their glamorous corporate brochures. I have often seen disabled people hanging low on confidence just because we as a society fail to associate with them. We do not want to marry our sons/daughters with them, we do not want to call them in our social functions, we treat them with extreme low level behavior as if they are some kind of an ugly disease, treating them way inferior and considering not worthy to live in this world. Why? May I ask? Just cause as perpetrators we fear how the society treat them or just cause we are blessed with good conditions that we do not realize the pain they suffer or is it that we do not understand cause we haven’t undergone the same? There’s a saying in Hindi that says- “ जाके पैर ना पड़ी बिवाई , वह क्या जाने पीर पराई". which roughly translates to- person who had not suffered the pain themselves would not know the other person’s suffering. But do we really need to turn the world blind to feel darkness? I am sorry if I am sounding harsh in my writings but trust me, people with disabilities did not chose the disabilities they suffer. It occurs to them either by birth or accidents (often someone else’ irresponsible behavior than one’ own). However, disabilities affect the body but not the soul, not heart, not the person’ zeal for life. People with disabilities have the same expectation and appreciation of life like the rest of us. Instead of shunning, mocking, ostracizing them, we must be more inclusive and support them in all endeavors. By support, I did never mean “pity” but “empathy”, an equal and more sensitive behavior. We must be sensitive to their needs, their special needs. Alas, in India we do not have infrastructures that may support them. Our roads, public utilities, public infrastructures like schools, railways, buses, stations etc are not very disable friendly, so does our policies of employment and development. There are quite some grants listed in govt sites but awareness for the same or availing the same is not as sufficient as it should be. Our educational institutes do not accept them heartily, our temples make God inaccessible for them (if they cannot remove shoes, junta doesn't allow them to enter temple premises. I have been through this). The institution of marriage boycotts them and parents think it’s best to pair a disable with another disable only. Above all, the treatment or the life support aids like good prosthesis etc is another distant dreams for them. In net, we are not an inclusive society, neither alive to their needs, nor respectful to their existence. Preventive care & Major improvement via early intervention- Like Nutritional interventions for mother & child, better road & workplace safety. Education for all- High end coordination with ministries of HRD, Social justice and empowerment, the general teacher traioning and rehabilitation needs to be improved and further more customized. Disabled kids and scholars should be encouraged to get educated. This also includes creating awareness about the aids available to disabled people and ensuring “what’s been created” should be “made available” too. 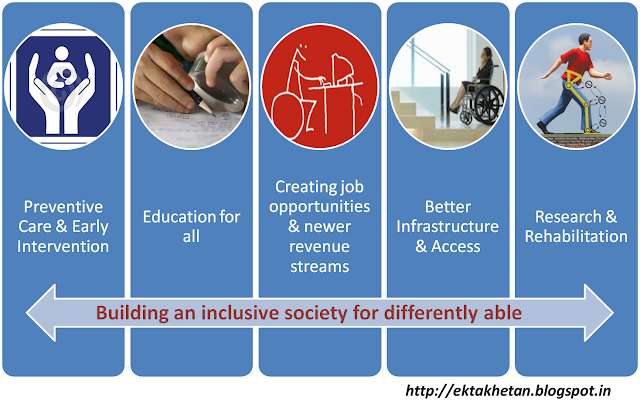 Better Infrastructure to enable & improve access (highly doable)- Designing & building ergonomically inclusive building, roads, footpaths etc. And above all lots of sensitivity, care and empathy which cannot be forced but embedded early in our value system. I hope that this a fair ask. It is less of “ask” but more of a request towards building a better and healthier society. After all, our kid follows what we teach them, they learn from us, directly and indirectly. The sole purpose of writing this post is to use the I Diya’s, ISB and Indiblogger platform to share the voice and spread it across, so even if a little sense could be sowed in public minds, it’s worth the effort. While a lot of disabled people live in pathetic conditions, some commits suicide, there are few of them who wants to fight back and sweat out demanding for an equal existence, bringing the best of their talents to create meaning for their lives but not without being scathed. These people become living embodiment of- Handicapped in body but not in spirit. I salute the spirit of such people and same time salute the spirits of organizations that work towards such cause to abolish the abhorred word “charity” or “pity” from such peoples’ life, bringing them up in life, enabling them to earn livelihood, gain confidence in due process and live a decent & respectful life. Very valid points, Ekta. Your tone isn't harsh but it it is strong and that is what is required to put a point across minds. Kudos to this thought provoking post. Thanks so much Akanksha. In case if you know any such org however small they may be, let me know. We can blog about them and get known across. Loved your post Ekta. Valid points and yes, more than anything else, people need to change their attitude and look at the differently abled as just another human being, to whom they must be cordial, if nothing else. Thanks Ghata. Sorry for replying late, yup attitudes needs to be changed from excluding to more inclusive. I don't think you are Harsh. To the point and Blunt - But then our society needs bluntness at times ! The attitude towards the differently abled must change. The first step could be our government providing a better infrastructure. I remember JNU was one such place that had ramps that could be used by differently abled people. I couldn't climb stairs for a few months due to a back problem and I used to be so frustrated when the lift at work was not working. I can hardly imagine facing issues like this day and and day out ! I have been associated with foot and mouth artists and they are doing a wonderful job ! Very touchy article.The points you mentioned are valid and should be implemented. Thanks Vishal. thanks for stopping by. I am glad you liked it. Some how our society is not sensitive to the differently able. A lot needs to be done to make our public places approachable by people on wheelchair. Yes and also for old aged ones. They need to some more warmth in their twilight hours. :) Thanks for sharing this Akash! Really salute ur parents. Yes u r above normal :) Take care. Kind of Sushmita. We r somehow seem to be losing grip on the great value system some of our ancestors taught us. Inclusive society is a better notion. Loved this post Ekta. Great Illustration. Your post brought out very important points. I lied in the UK for sometime and saw how sensitive people are to the needs of the handicapped people. There are special ramps for people who cannot walk at each and every public building. Guide dogs are provided to the people who cannot see and the city council helps people who have some mental illness by providing nurses and caregivers. I wonder when will our country be sensitive to people who face challenges in their lives every day. I soo much agree with you! I have heard of similar tales from friends & family in USA and UK...Somehow as a country we fail to imbibe the good thing about west and waste our efforts only on fads etc..Waiting when Indian Infrastructure will become more robust and when we will be known for better things than just scams in name of developments. The problem with this nation is that we do not respect life. That will be the first step - To acknowledge that a disabled person is entitled to a happy life as much as everyone else. Yup... i agree. Even the well-abled people do not realize the same. They hang behind buses and vehicles, cross roads in midst of traffic and all those stupid acts. 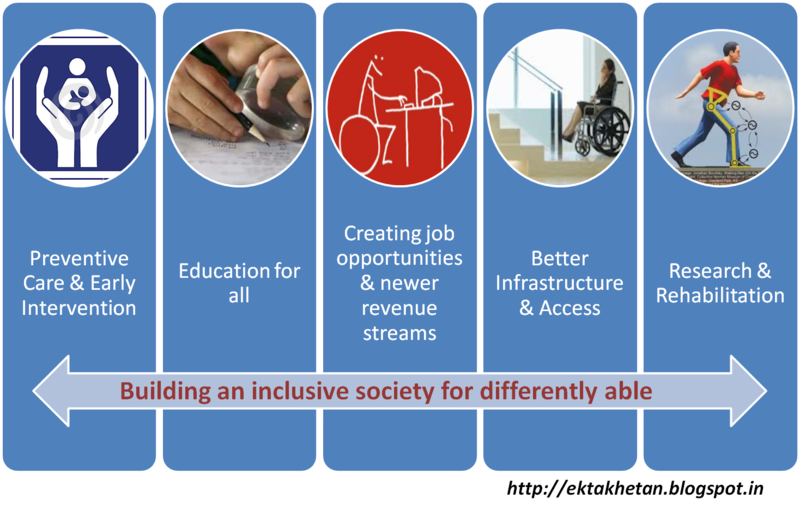 Even though there are more organisations taking care of differently-abled persons, the society needs more changes regarding their accessibility related issues. indeed a very good post, Ekta.